Your main character/fursona, did you design them yourself? 190 deviants said Yes, I made them all from scratch! 12 deviants said I got the original design from someone else, but added my own twist to it. 8 deviants said Yes, though other people helped me with it. 6 deviants said Nope! Someone else designed them completely. 6 deviants said I don't have a main character. 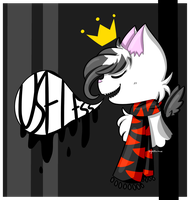 The orginins of my fursona come from my first fanfic. It's basically me as a penguin. That depends on a lot of things. Can Mickey be considered my fursona? I'd say not, he's evolved into a separate character. Even so, what could one consider as "original?" Luxrays are someone else's species, but I did add my own twist to them. Even then, I did receive help from someone else- the bow he tends to wear was someone else's idea. Ahh, I see :0 Yea, it's tricky with Pokémon characters! 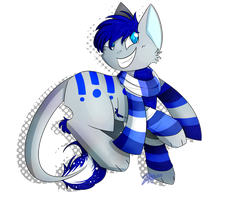 I adopted my fursona, Lighty, 4 years ago from someone who was giving away their unused characters. That's also why her name isn't that great (full name is Lightning)--she's from THAT era of our art. I'd feel bad changing her name now though since I've had her so long. I've tweaked her a couple times but she's got the same basic elements. I think she's still recognizable at least. Mostly just adjusted colours, added some back stripes, and rarely draw the headphones these days. Mine is a mix of myself and my first dog since I always felt such a bond between her. 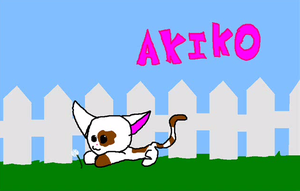 Originally the design was a normal black cat with red eyes. She's evolved into this over the past ten years, aha. Mitty was my fursona kinda but I honestly feel she is just more of a main character now. I've known what I've generally wanted her to look like since 2012. (Which I find crazy how she is almost 3 years old now) Her design has kinda bounced around before then though. Before I decided to make her pink with orange stripes, I wanted her to be grey with black stripes. Other than that I haven't made any huge changes maybe small tweaks, otherwise nothing too big. 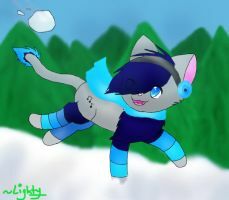 My main fursona, Jade (the one I told you about. I drew her finally! ), was made from scratch. She is a frost elemental shape shifter/dragon. Most of the other ones I made are from scratch. Some of them I don't even know what they will look like yet! then it changed bc i didnt like it at all, so she only got 4 stripes and that was also too much for me xD so she got 3 stripes. but she was always a two toned wolf, and stay one owo"
I just saw it, omg. Same ouo She looks nice! 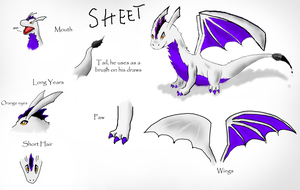 My baby, Runnee, was designed back in October of 2014, when I lived with my grandparents and was lonely on a summer day. I designed Light by myself before joining. She had loads of changes though. I think making your fursona/main character by yourself makes them more unique and closer to you. I guess most people think so, yes! Yep! The only thing I had help with was picking the species, because I needed help figuring out what kind of animal would fit me. That is always hard, yes!